How much leverage does a company have? The Debt to Equity ratio (also called the “debt-equity ratio”, “risk ratio”, or “gearing”), is a leverage ratioLeverage RatiosA leverage ratio indicates the level of debt incurred by a business entity against several other accounts in its balance sheet, income statement, or cash flow statement. Leverage ratios include debt/equity, debt/capital, debt/assets, debt/EBITDA, and interest coverage. This guide has exmaples and Excel template that calculates the weight of total debt and financial liabilities against the total shareholders’ equityStockholders EquityStockholders Equity (also known as Shareholders Equity) is an account on a company's balance sheet that consists of share capital plus retained earnings. It also represents the residual value of assets minus liabilities. By rearranging the original accounting equation, we get Stockholders Equity = Assets – Liabilities. Unlike the debt-assets ratio which uses total assets as a denominator, the debt to equity ratio uses total equity. This ratio highlights how a company’s capital structureCapital StructureCapital Structure refers to the amount of debt and/or equity employed by a firm to fund its operations and finance its assets. The structure is typically expressed as a debt-to-equity or debt-to-capital ratio. Debt and equity capital are used to fund a business’ operations, capital expenditures, acquisitions, is tilted either toward debt or equity financing. If, as per the balance sheetBalance SheetThe balance sheet is one of the three fundamental financial statements. These statements are key to both financial modeling and accounting. The balance sheet displays the company’s total assets, and how these assets are financed, through either debt or equity. Assets = Liabilities + Equity, the total debt of a business is worth $50 million and the total equity is worth $120 million, then debt-to-equity is 0.42. This means that for every dollar in equity, the firm has 42 cents in leverage. A ratio of 1 would imply that creditors and investors are on equal footing in the company’s assets. 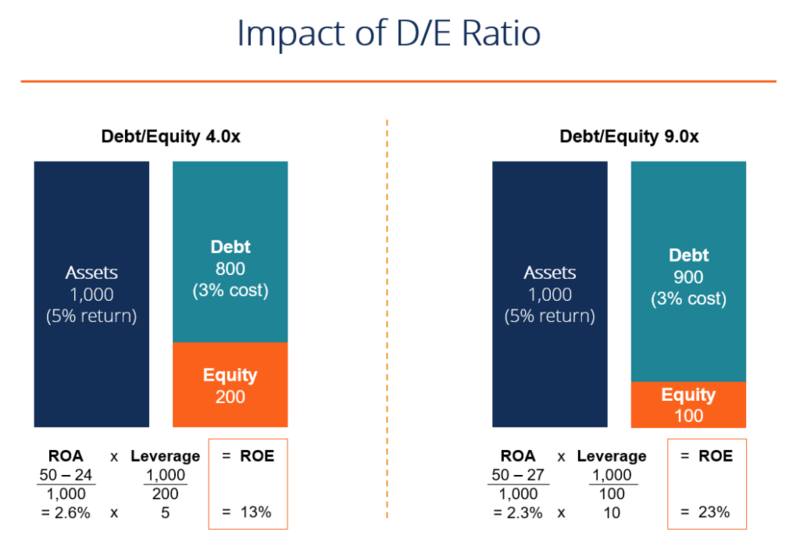 A higher debt-equity ratio indicates a levered firmDegree of Financial LeverageThe degree of financial leverage is a financial ratio that measures the sensitivity in fluctuations of the company’s overall profitability to the volatility of its operating income caused by changes in its capital structure. The degree of financial leverage is one of the methods used to quantify a company’s financial risk, which is quite preferable for a company that is stable with significant cash flowThe Ultimate Cash Flow Guide (EBITDA, CF, FCF, FCFE, FCFF)This is the ultimate Cash Flow Guide to understand the differences between EBITDA, Cash Flow from Operations (CF), Free Cash Flow (FCF), Unlevered Free Cash Flow or Free Cash Flow to Firm (FCFF). Learn the formula to calculate each and derive them from an income statement, balance sheet or statement of cash flows generation, but not preferable when a company is in decline. Conversely, a lower ratio indicates a firm less levered and closer to being fully equity financed. The appropriate debt to equity ratio varies by industry. Learn all about calculating leverage ratios step by step in CFI’s Financial Analysis Fundamentals Course! A company’s total debt is the sum of short-term debt, long-term debtLong Term DebtLong Term Debt (LTD) is any amount of outstanding debt a company holds that has a maturity of 12 months or longer. It is classified as a non-current liability on the company’s balance sheet. The time to maturity for LTD can range anywhere from 12 months to 30+ years and the types of debt can include bonds, mortgages, and other fixed payment obligations (such as capital leases) of a business that are incurred while under normal operating cycles. Creating a debt scheduleDebt ScheduleA debt schedule lays out all of the debt a business has in a schedule based on its maturity and interest rate. In financial modeling, interest expense flows into the income statement, closing debt balance flows onto the balance sheet, principal repayments flow through the cash flow statement, completing the scheudle helps split out liabilities by specific pieces. Not all current and non-current liabilities are considered debt. Below are some examples of things that are and are not considered debt. A high debt-equity ratio can be good because it shows that a firm can easily service its debt obligations (through cash flow) and is using the leverage to increase equity returns. In the example below, we see how using more debt (increasing the debt-equity ratio) increases the company’s return on equity (ROE)Return on Equity (ROE)Return on Equity (ROE) is a measure of a company’s profitability that takes a company’s annual return (net income) divided by the value of its total shareholders' equity (i.e. 12%). 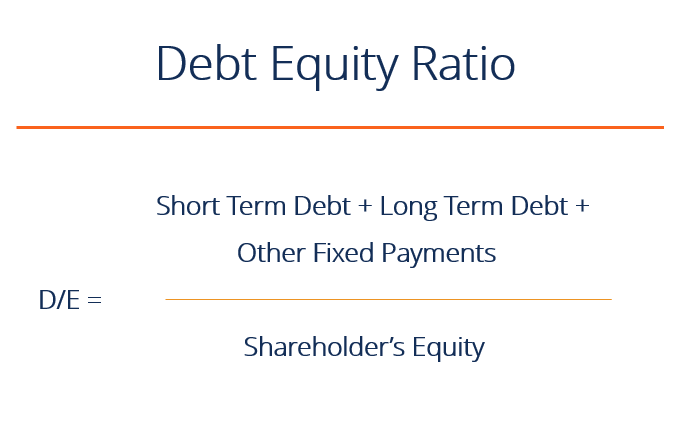 ROE combines the income statement and the balance sheet as the net income or profit is compared to the shareholders’ equity.. By using debt instead of equity, the equity account is smaller and therefore return on equity is higher. Another benefit is that typically the cost of debt is lower than the cost of equityCost of EquityCost of Equity is the rate of return a shareholder requires for investing in a business. The rate of return required is based on the level of risk associated with the investment, which is measured as the historical volatility of returns. Learn the cost of equity formula with examples and download the Excel calculator, and therefore increasing the D/E ratio (up to a certain point) can lower a firm’s weighted average cost of capital (WACC)WACCWACC is a firm’s Weighted Average Cost of Capital and represents its blended cost of capital including equity and debt. The WACC formula is = (E/V x Re) + ((D/V x Rd) x (1-T)). This guide will provide an overview of what it is, why its used, how to calculate it, and also provides a downloadable WACC calculator. This is covered in step by step detail in CFI’s Free Corporate Finance Course! The opposite of the above example applies if a company has a D/E ratio that’s too high. In this case, any losses will be compounded down and the company may not be able to service its debt. If the debt to equity ratio gets too high, the cost of borrowingCost of DebtThe cost of debt is the return that a company provides to its debtholders and creditors. Cost of debt is used in WACC calculations for valuation analysis. Learn the formula and methods to calculate cost of debt for a company based on yield to maturity, tax rates, credit ratings, interest rates, coupons, and will skyrocket, as will the cost of equity, and the company’s WACCWACCWACC is a firm’s Weighted Average Cost of Capital and represents its blended cost of capital including equity and debt. The WACC formula is = (E/V x Re) + ((D/V x Rd) x (1-T)). This guide will provide an overview of what it is, why its used, how to calculate it, and also provides a downloadable WACC calculator will get extremely high, driving down its share price. Below is a simple example of an Excel calculator to download and see how the number work on your own. 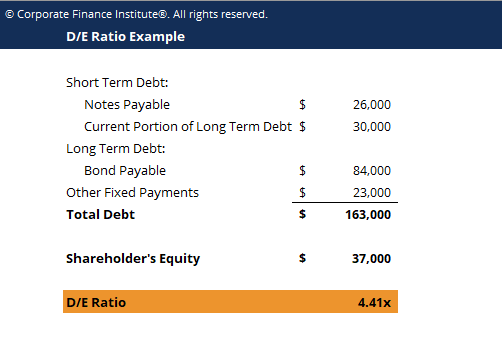 Below is a short video tutorial that explains how leverage impacts a company and how to calculate the debt/equity ratio with an example. Thank you for reading CFI’s guide to the debt to equity ratio. CFI is the official provider of the Financial Modeling and Valuation Analyst (FMVA)® designationFMVA™ CertificationThe Financial Modeling & Valueation Analyst (FMVA)™ accreditation is a global standard for financial analysts that covers finance, accounting, financial modeling, valuation, budgeting, forecasting, presentations, and strategy. designed to transform anyone into a world-class financial analyst.